Clematis 'Jackmanii' is how this plant is referred to in plant taxonomy. 'Jackmanii' is the cultivar name. It was named after the 19th-century British nurseryman, George Jackman. The plant is a deciduous, woody vine. It is also a hybrid plant, which is why the botanical name of this buttercup-family member is sometimes given as C. x 'Jackmanii,' the parents being C. lanuginosa and C. viticella. Jackman's clematis will bloom in July in a zone-5 garden, for example. Its large (5 inches across) blooms, which come in a dark purple-violet color, make it one of the prettiest flowering vines. Achieving a height of 10-13 feet (occasionally more), it is big enough to capture one's attention when in bloom without being too overpowering for a small space (as a taller type of clematis might be). This perennial is considered a climber. It will twine its way around the support you provide for it. Grow this flowering vine in the sun to partial shade. Although classified as a perennial vine for sun, it can take a bit more shade than can many other types of clematis. The recommended growing zones for it are 4-8. On the disease front, clematis is susceptible to a type of wilt (see next section). 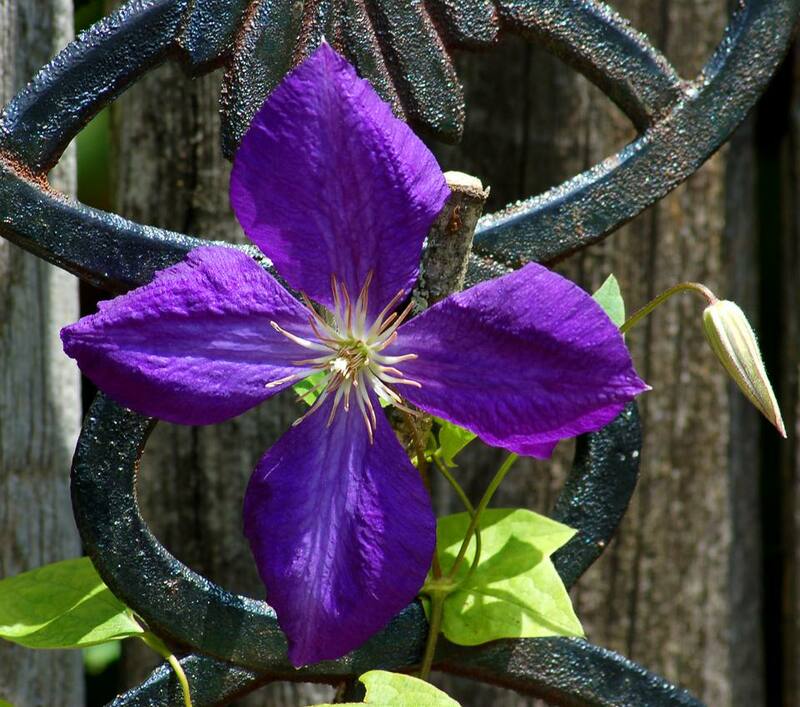 Let's begin at the beginning for clematis care: proper planting. After you bring the vine home from the garden center and gently knock it out of its pot, you should plant it so that the top of the root ball lies 3-4 inches beneath ground level. Going down that deep promotes the development of what are termed "latent" buds below ground level. Their presence is your insurance policy against the disease, clematis wilt, which could cause above-ground vegetation on your vine to die. The practice of deep planting also helps keep the roots cool. There are supplemental policies you can follow, as well, to keep your vine's roots cool. Mulching is the most obvious approach. Other gardeners shade the base of the vine with ground covers (but avoid any with deep root systems, as these would interfere with the root system of the clematis). Still, others place flagstones or other objects at the base to cast shade. However, the latter practice could provide an open invitation to a known clematis pest: slugs. If you do go with flagstone, check it frequently and see if you can catch any slugs napping (rendering the flagstone essentially a "slug trap"). It blooms on new wood. And therefore the time to prune it is from late winter to early spring. Some experts say it is best not to prune a new vine very much (unless it is to remove dead branches, which can be done at any time), advising you to give it time to put on some growth. But once it matures, you may see it losing vigor -- or it may just be getting too overgrown for your tastes -- and that is the time to begin a spring pruning regimen (if you have not already). While some perform a drastic pruning, many growers prune in a more targeted fashion, cutting the vines down to a preferred height where there are good leaf buds present. If you are an organic gardener, fertilize with compost. Otherwise, apply a complete fertilizer each spring. Err on the size of too little when using commercial fertilizers rather than too much. You need to shelter clematis roots from the blazing sun. One way to do so is to apply about 2 inches of mulch to protect the root zone. If you know what a clematis vine is, then there is a good chance that you know Clematis 'Jackmanii.' If there is a more commonly-grown type, then it is news to this author. But its very ubiquity inspires some to cast aspersions against it. The preceding is a reference to the folks who have been aptly dubbed the "garden snobs" (some of them work in the green industry, others are avid gardeners). Do not go to them to learn more about this illustrious vine. They may try to dissuade you from growing it. Their reason? "It is overused," they assert. In other words, in their minds, the very fact that it is so commonly grown somehow counts as a demerit against it. "It is used a lot. Therefore you should not use it" -- for some of us, such logic is difficult to relate to. For those who may find themselves baffled by it, let's attempt to explain it via an analogy. Let's say you are a food critic. You have been to so many Italian restaurants in your life that you now have mozzarella in your bones, not marrow. You are tired of the classic lasagna -- not because it does not taste good, but because there is only so much you can write about it that has not already been said thousands of times already. And what you need above all for your food column is something new to say. Now, if someone within your circle of friends asks you how you feel about the classic lasagna, you may well let your emotions get the best of you and dismiss it as being too common. But this is merely a knee-jerk reaction that arises out of your circumstances. Unfortunate, indeed, would be the friend unfamiliar with Italian food who, based on your dismissal of it, decided never to try this wonderful dish. Popular plants generally gain their popularity for good reasons. Jackman's clematis is a vigorous yet compact vine with fabulous flowers. The fact that many people grow this vine in no way detracts from these superior qualities. A more rational attitude toward Jackman's clematis can be summed up by adopting a line from the lyrics of Bill Withers' song, Use Me (1972): overuse it until you use it up! A standard way in which to use the vine is as camouflage for eyesores in the landscape, or for landscaping around mailboxes, where the vine is trained up a mailbox post as a decoration. In fact, this latter use is so widespread that Allan Armitage, in Armitage's Garden Perennials, jokingly lists "Clematis mailboxensis" as if it were a variety that you could grow (p. 85).